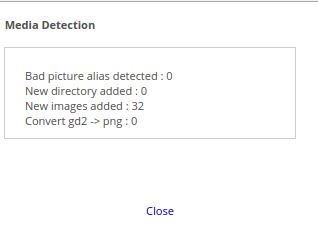 Medias are images used by the Centreon web interface. These images are used to represent the monitored resource in a more intuitive way, propose backgrounds for cartography modules, etc. All the images are stored in the folder entitled: /usr/share/centreon/www/img/media of the Centreon server. Use automatic synchronization: this method has the advantage of being able to import multiple images at the same time.